Do diaspora Jews have a role in making peace? JERUSALEM ““ Cloistered away in a snug meeting room with stone-faced walls and arched doorways across from Jerusalem’s Old City, some of the most important Jewish communal leaders in the world came together recently to wrestle with a question: Is there a role for the diaspora in Israel’s decision-making on peace? The forum was part of the annual conference of the Jewish People Policy Institute, a think tank organized by the Jewish Agency for Israel that identifies and evaluates challenges facing Jewish communities around the world. The consensus of the participants was that while ultimately it is up to the Israeli government and the Israeli public to decide the outlines of a peace deal, input from the rest of the Jewish world should be considered. In particular, several participants said, the issue of whether or not to divide Jerusalem requires input from the diaspora. “The achievement of a peace agreement would be tremendously liberating for the global Jewish people,” said Barry Rosenberg, executive vice president of the Jewish Federation of St. Louis. The challenge remains for the JPPI to move away from being an A-list talk shop to affecting policy on the ground. 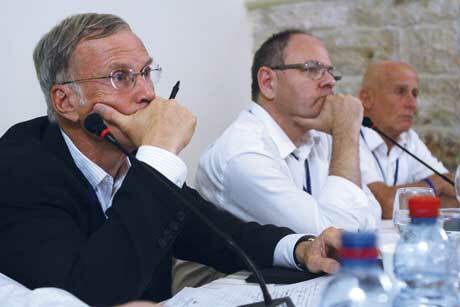 To that end, one of recommendations that emerged from the two days of talks was for the creation of a small forum of diaspora figures to discuss final status issues with the Israeli government – a “go-to” team that the government could consult with, as the institute’s founding director, Avinoam Bar-Yosef, described it. “Who do you call? Who represents the diaspora? Who represents even American Jews ideologically? Politically?” Abrams asked. Indeed, consensus was often elusive among the 120 participants, who represented academia and Jewish organizational and Israeli political leadership. In addition, some of those attending criticized the absence of women and participants under the age of 50 at the conference – something organizers said they were working to improve. The challenges are not dampening the ambitious vision of the JPPI’s chairman, Stuart Eizenstat, the former U.S. diplomat who assumed the post after Dennis Ross, a former U.S. Middle East peace envoy, stepped down in order to work for the Obama administration. Eizenstat said a key goal of his was for the think tank to have “more of a policy impact” on peace issues and other topics affecting the future of the Jewish people. One move in that direction was the institute’s decision to summarize the various teams’ findings on several issues into pithy, action-minded policy position papers for use by both the Israeli government and Jewish organizations. Among the issues dealt with at the conference: peace efforts, the delegitimization of Israel, conversion, European Jewry, and Israel-diaspora relations. “The value of the JPPI is that nowhere else do you have these kinds of discussions,” he said. The forum on the delegitimizaton of Israel garnered particular interest, especially regarding how Israeli policy and actions, especially military ones such as the recent Gaza flotilla incident, play out – both for Israel on the international stage and for diaspora Jews. To that end, conference leaders announced that Israeli President Shimon Peres, who was among the top-level speakers, including Prime Minister Benjamin Netanyahu, was considering a tour of several college campuses in the United States.